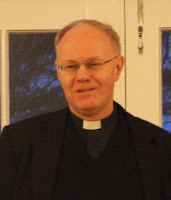 To catch up on my previous post at the beginning of the Symposium: Fr Nesbitt's second lecture discussed the question of the mission of Christ as a struggle against the kingdom of Satan, a New Testament theme that is often neglected. The discussion focussed particularly on the question of the relationship of angels and demons to the order of material creation and the place of the created spirits in the overall economy of God. 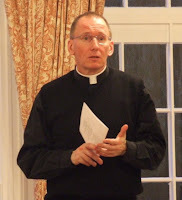 I mentioned also that it was Fr David Standen's 50th birthday. Cakes and champagne all round to fete the man who arranged all the practical details for us and helped us to eat at various points rather than continue discussing philosophy and theology ad infinitum. 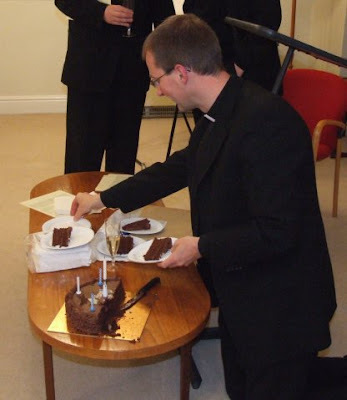 Below, Fr Dylan James is kneeling at a coffee table and breaking cake to share. It might appear as though he has become enamoured of creative liturgy during his time in Rome but I hope that you can see that this is all harmless in the context of the celebrations for Fr Standen.